In this paper we obtain some identities containing generalized Fibonacciand Lucas numbers. Some of them are new and some are well known.By using some of these identities we give some congruences concerninggeneralized Fibonacci and Lucas numbers such asV 2mn+r ≡ (−(−t)m ) n V r (mod Vm ), U 2mn+r ≡ (− (−t)m ) n U r (mod Vm ), and V 2mn+r ≡ (−t)mn V r (mod Um ), U 2mn+r ≡ (−t)mn U r (mod Um ). P. Ribenboim, My numbers, My Friends, (Springer-Verlag New York, Inc., 2000). S. Rabinowitz, Algorithmic Manipulation of Fibonacci Identities, Applications of Fibonacci Numbers 6, Kluwer Academic Pub., Dordrect, The Netherlands, 389–408, 1996. J. B. Muskat, Generalized Fibonacci and Lucas Sequences and Rootfinding Methods, Mathematics of Computation, 61, Number 203, 365–372, July 1993. D. Kalman and R. Mena, The Fibonacci Numbers-Exposed, Mathematics Magazine 76, 167–181, 2003. S. Falcon and A. Plaza, The k-Fibonacci Sequence and The Pascal 2-Triangle, Chaos, Solitions and Fractals 33 , 38–49, 2007. S. Falcon and A. Plaza, On The Fibonacci k-numbers, Chaos, Solitions and Fractals 32, 1615–1624, 2007. R. Keskin and B. Demirt¨ urk, Solutions of Some Diophantine Equations Using Generalized Fibonacci and Lucas Sequences, Ars Combinatoria (in press). J. P. Jones, Representation of Solutions of Pell equations Using Lucas Sequences, Acta Academia Pead. Agr., Sectio Mathematicae 30, 75–86, 2003. M. E. H. Ismail, One Parameter Generalizations of the Fibonacci and Lucas Numbers, The Fibonacci Quarterly 46-47, 167–180, 2009. T.-X. He and P. J. S. Shiue, On Sequences of Numbers and Polynomials Defined By Linear Recurrence Relations of Order 2, International Journal of Mathematics and Mathematical Sciences 2009 , 21 page, 2009. R. Keskin and B. Demirt¨ urk, Some New Fibonacci and Lucas Identities by Matrix Methods, International Journal of Mathematical Education in Science and Technology, 1-9, 2009. ISNAD Şiar, Zafer , Keskin, Refik . "Some New Identities Concerning Generalized Fibonacciand Lucas Numbers". 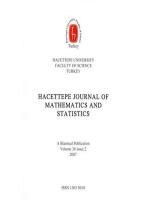 Hacettepe Journal of Mathematics and Statistics 42 / 3 (March 2013): 211-222.